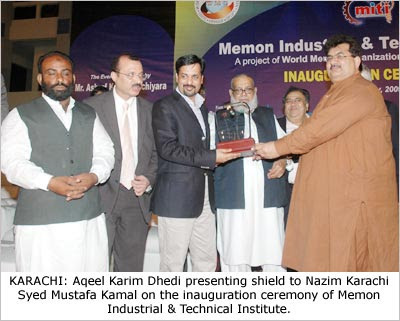 KARACHI: City District Government Karachi (CDGK) has established Pakistan’s first Industrial and Technical Institute in Korangi under partnership with World Memon Organization. The Institute will impart technical education to more than 4 thousand uneducated and unskilled youths annually in 30 different trades. The 24 week training would enable them to get the jobs up to Rs.15,000 remuneration. Nazim Karachi Syed Mustafa Kamal inaugurating the institute yesterday announced to establish such institutes in all 18 towns of Karachi. The inaugural ceremony was attended by president of World Memon Organization Haji Abdul Razzaq Yaqoob, Amin Chappel, Shoaib Ismail, Abubakar Qasim, Pir Muhammad Kalia, Aqeel Karim Dhedhi, H.M Shahzad, Ashraf Machiara, Ahmed Chinoy, MNA Abdul Rasheed Godel, Asif Husnain, members of provincial assembly, Nazim Korangi Town Arif Khan Advocate and a large number of representatives from trade and business community. Speaking on this occasion City Nazim said that he had been told by the organizers that the youth will only have to pay Rs.500 as fees for the course while the expenditures incurred on their training will be Rs.2100. Those students who are unable to pay even Rs.500 will get fee exemption and the organization will arrange for the expenditures. He said that despite of all the hurdles and oppositions we have entered into a public private partnership agreement with World Memon Organization for establishment of this institute because we thought it would be beneficial for the poor and middle class youths. He expressed hope that this institute would bring about revolution in the field of technical education not only in Karachi but in whole province and country. Nazim Karachi further said that we want to set up such institutes in every nook and corner of Karachi so that the jobless, uneducated and unskilled youth of our country could be made useful citizens. He called it unfortunate that the land mafia was occupying precious land in the city and due to legal complications the land could not be used for public welfare projects. Paying tribute to office bearers of World Memon Organization for establishment of this institute City Nazim said that other communities living in Karachi should also come forward and play their role in the resolution of social and financial problems of this city. He said that latest technology and skills are need of the hour and the institute will also start offering training courses for women in next three months. Nazim Karachi said that the construction of flyovers, underpasses and signal free corridors in Karachi has stretched the long distances between different areas and now the youth from other towns would also get easy access to this institute for getting training.